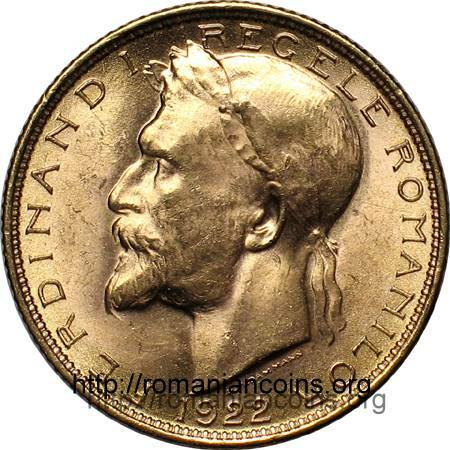 denomination 20 LEI, ROMANIA and middle coat of arms of the country, outer pearl circle effigy of the king crowned with a laurel wreath, facing left (or right in heraldic perspective), year 1922 and inscription "FERDINAND I REGELE ROMANILOR" meaning "FERDINAND I KING OF ROMANIANS", outer pearl circle. Under the effigy's neck lies inscription P. M. DAMMANN, the engraver's name. 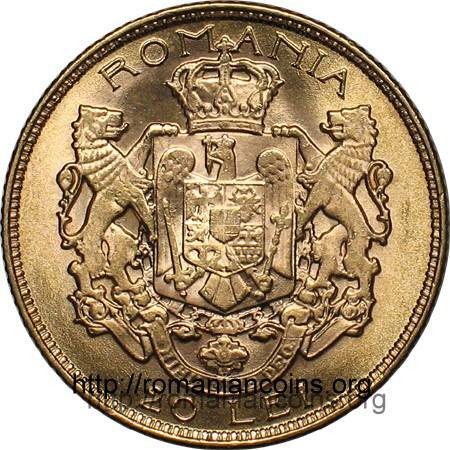 In 2008 the National Bank of Romania issued a replica of 20 lei 1922 gold coin, for the 90th anniversary of the Great Union from 1st of December 1918.